Usually, wedding clients are just that, when I meet them for the first time: clients. This time however, I'd known Aamir since our time at University. So when he asked me to be the photographer for his wedding I nearly bit his hand off! It's not everyday that you get to go on the stag do, AND photograph the wedding! Barton Hall in Kettering, Northamptonshire was the setting for their wonderful wedding, and as myself and my assistant shooter Stu drove up from Leicester the windscreen was just starting to splatter with the first drops of rain. Your average photographer might be a bit dismayed; shooting in the rain does limit what we can do sometimes, but I had had an idea in my head throughout all of last wedding season for a dramatic, back-lit shot of the couple in the rain and hadn't yet had the right conditions, or couple, to execute it. The weather cleared up as we approached the wedding venue and the sun even came out from behind the clouds! My first stop was Milli's room for the bridal prep where I found her sipping on buck's fizz and getting her hair done, a perfect picture of calm amongst a gaggle of excited bridesmaids! Stu headed next door to where the groom was putting the final touches to his look. The orangery at Barton Hall looked amazing for their civil ceremony, and with the thin layer of cloud in the sky, the light was fantastic for some natural light shooting of the registry ceremony. 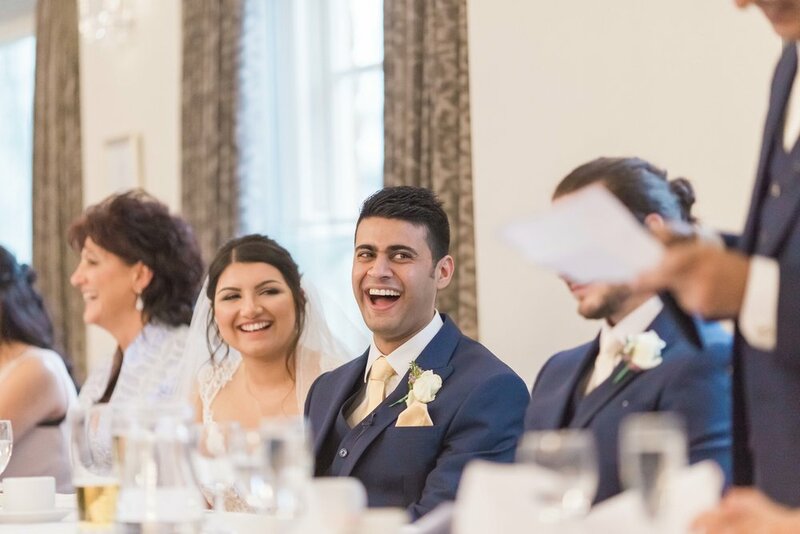 The excitement amongst the guests, and the groom, was high which made for a lovely and emotional registry ceremony. After the group shots we took the newlywed couple away for a quick 15 minute shoot (with the promise of more photographs of the two of them in the evening) as they were understandably keen to get back to their guests! After some touching and hilarious speeches, and some wonderful food, we headed outside for portraits of the groomsmen and bridesmaids, and a few more photographs of the bride and groom in the rain! The party continued well into the night. Aamir and Milli, thank you both so much for allowing me to capture your day! If you're ready to book me for your wedding, you can get in touch here!